John Calipari and Jim Tressel are two of the sleaziest coaches in sleazy business of big time college sports. “Everyone” knows this about Calipari, who has an extensive history of maintaining a conveniently comprehensive ignorance regarding the extensive shenanigans going on at the programs where he’s coached. Yet despite more than a few striking parallels with Calipari, Tressel has — or at least had until a couple of weeks ago — a “sterling reputation” as a fine Christian gentleman, a molder of young men in the tradition of Thomas Arnold, who 150 years ago first gave ideological content to the idea that the Battle of Waterloo was won on the playing fields of Eton — a pernicious bit of nonsense that Anglophile American universities have been repeating ever since. Perhaps you’ve had this experience. A fan of some other school will ask you what you think of Tressel. You say you respect his ability as a coach, but he’s kind of dirty. And they look at you like you’re some crazed partisan. Tressel? The Senator? Dirty? Come on. Then, of course, Terrelle Pryor, with his transparently ludicrous story of car dealerships that keep giving him loaner cars to replace his car that keeps breaking down. Either Buckeye players have been getting paid off consistently, or else there’s a massive conspiracy to create this impression. My sense is that one significant factor in the different reputations the two men have acquired has to do with the cultural signaling performed by their respective self-presentations. Basically, John Calipari looks and dresses like a connected guy, while Tressel presents himself, semiotically speaking, as a cross between a stern but fair high school principal and a minister in a mainline Protestant denomination. Clothes, as the old saying has it, make the man (the academic version of this aphorism is “Think Yiddish, dress British”). I think a lot of it has to do with the players involved as well. A lot of college football fans see Tressel’s players as a helmet, while they see Calipari’s players as “thugs”. There’s something to that, but it’s not like other basketball teams wear helmets. Calipari’s reputation is crummy compared to other basketball coaches too. I tend to think that there are much bigger problems with the NCAA than Calipari, and on the grand scale of things, Calipari’s sleaze is a benefit for his players, but yes, Calipari has earned his reputation and doesn’t hide it near as well as Tressel. Of course Tressel never fooled this Michigan fan. It’s amazing how Ohio State always ends up with the sleaziest coaches of all time, isn’t it? One big pile of sleaze there in that athletic department. To his credit, though, Tressel has been strong on the issue of oversigning, which bugs me more than players getting tattoos. I always liked Father Tom Osborne’s Home for Troubled Boys, especially after he went off to Congress and voted against every social program he had the chance to. Osborne is very similar to Tressel — he was every bit as dirty as Barry Switzer, but Switzer always looked and sounded like the son of bootleggers (which he actually was), while the Rev. Tom got away with metaphorical murder while giving sermons every Sunday. Mark Dantonio has pretty much pulled off this trick, too. He’s earned some sort of reputation as a disciplinarian basically be assertion, religiosity and constant public scowling. His players aren’t any better behaved than any other 100 college athletes. Which Dantonio probably learned from his time on Tressel’s staffs. As a Michigan State fan/alum I’m pretty happy with the state of affairs, because he also seems to have learned how to coach and recruit from Tressel and/or Nick Saban. The main takeaway is that Charles Pierce’s notion (expressed early in the Bush II administration) that political pundits get away with nonsense that sportswriters would never allow is a nice notion, but not supported by the facts. Well I’m sure now that he’s AD everything will be on the up and up. That is a very good point. I wonder if it also has something to do with the amount of players on a football team vs. a basketball team. One player on a football team can’t carry it, no matter how good he is. As such, there is less media glare given to any particular player. So it’s far easier to point to a lot of other players that aren’t in violation (or haven’t been caught) and claim that the player who got caught was a bad apple. In basketball, a single player can have much, much more impact. And so they are linked much more closely to programs and coaches. But I think confirmation bias among the media for the established narrative is the best explanation. I mean, Brett Favre is a stand-up family man, amirite? You are definitely correct that Calipari’s sleaziness is a bigger advantage in college basketball than Tressel’s is in college football. However, the entire Cam Newton scenario leads me to believe all things equal, shadiness concerning extremely important player in college football doesn’t raise quite the stink either. Unfortunately, ESPN is just trying to play to its audience. …shadiness concerning extremely important player in college football doesn’t raise quite the stink either. Nor does shadiness concerning a lot of moderately important college football players, per your mention of oversigning above. Lends credence to your initial basketball v. football theory. I think a lot of what bugs people, and I’m not endorsing the view, is when a player does the “selfish” thing and leaves for a professional paycheck before graduating. It happens in both sports, but I think the factors you and Brad have mentioned (fewer players and faces with names) lead to people being more aware of it in basketball. Plus, as you’ve said, basketball can seem a more individualistic, i.e. flashy and selfish, game. Once you’ve got the “greedy” narrative going it’s easily compounded. Is this what you were looking for on that first image? Or maybe this? I like that the title changed but the generic Kentucky pic remains. I know, right? I was actually thinking “semiotics” would be a better choice, but first things first–WHERE’S THE GEL? 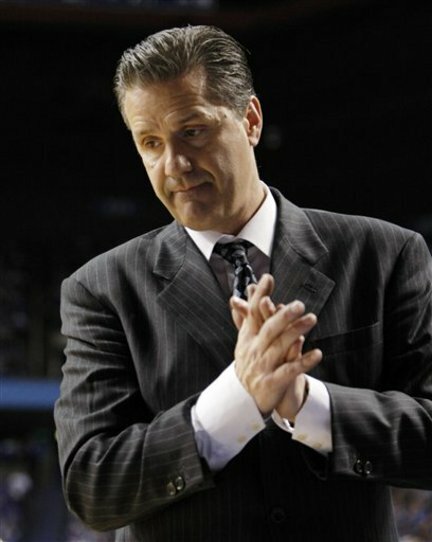 Does anybody have any thoughts about the relative ethics of Jim Calhoun vs. John Calipari? Calhoun used to have some pretty harsh stuff to say about Calipari when he was at UMass, implying UConn was clean and UMass was not. With all the problems that UConn has had with the NCAA lately, I’d hear Calipari’s thoughts on who is and isn’t ethical. Football has a more conservative fanbase than basketball so it’s not surprising that they lack self-reflection when it comes to corruption. The point about Tressel’s players being in helmets is certainly important. Also important I think is the fact that Calipari has skipped out of town one step ahead of the law twice, while Tressel has been in Northeast Ohio for twenty years. I think this is part of what surprised me about UK hiring Calipari … it was in effect asking to be investigated by the NCAA. At least one of Tressel’s players at Youngstown, Ray Isaac, accepted improper benefits. I believe that by the time Youngstown received any penalties from the NCAA, Tressel was already at Ohio State. I confess, it’s a bit odd to see a progressive blogger condemning a millionaire coach on the basis that his program finds ways to kick some money to the athletes generating the revenue that results in the old white guys in the racket making millions of dollars annually. I think the underlying question is hypocrisy, not whether the college athletes deserve to get paid above the table. I have no dog in the Big10 hunt. My effete East Coast U dropped football in the early 90s, and made the hoops field this year (one and done) for the first time in decades. But I find Tressel (and hus insufferable university president, Gee), much harder to take than Calipari. The latter says in so many words: get me some great freshmen, and I’ll make the final four(tm) and get them zillions of bucks in the pros. The hypocrites at THE Ohio State University :::retch::: go on and on about “student athletes” – the worst oxymoron, at that level of competition, ever. BTW I blame Brett Musberger for Tressel’s image. No, I’m not joking. Breaking NCAA rules is cheating, just like using steroids, or cheating on a test. And these goombahs hold themselves up as all that is left of what is good in this country. They do it for the kids. Yep, it’s all for the kids. Yes, “breaking the rules” is bad but take a look at the NCAA rules regarding “student-athletes” and some of the infractions they have invoked. It will very likely piss you off. If you want real student-athletes, to to division II or III programs. The real crime, IMO, is the NCAA pretends that their major college programs in football and basketball are not big business with labor subjected to the old IOC rules on amateurism. Please don’t take this as an excuse for bad behavior by the athletes and coaches but it is easy to see where the seed is planted. Right. Remember that this whole flap with Ohio State started because the athletes sold property that ostensibly belonged to them. You can’t get all high and mighty about “breaking the rules” without at least noting the sheer inhumanity of said rules. Wait until someone at the NCAA looks into the cost of tattoos. They cost a lot more than college kids have in pocket money. That little flower on you foot might only cost you $50, $75 but ink up and down your arms is a lot more expensive. Now think back to what, 3 out of 5 college footba1l and basketball players walking around out there. I think that a lot more schools have a “Tressel” problem than has been reported yet. Tressel may look mainline Protestant, but he’s more likely to be preaching the prosperity gospel.